A nation struggling to recover from one crisis has been hit by another. Naomi Mihara reports from Kathmandu. The day I arrived in Kathmandu, the Nepal government had just announced a quota system limiting the number of vehicles on the roads in response to the fuel crisis. Very few private vehicles were plying. Buses were completely packed. Taxis were charging three or four times the usual rate. I had read about the protests taking place near the Indian border over Nepal’s new constitution even as I left England. I knew about the blockade of supply trucks at the border, and, in an abstract manner, about the fuel shortage that was beginning to grip the country. But I had little idea how much the situation was affecting everyday life across a country struggling to get on its feet after a devastating earthquake—and how angry, and upset, Nepalis were with their ‘Big Brother’ across the border. India’s role in the fuel crisis has been extensively reported, and it would be difficult to find a Nepali who believes New Delhi’s claim that it was concern for the truck drivers’ safety that was behind the pile-up of supply vehicles at the border on the Indian side. Every person I spoke to in Kathmandu seemed to believe, perhaps with some justification, that India had effected an unofficial economic blockade to pressurise Nepal into editing certain provisions in its brand new constitution—specifically, those relating to the demands of the Madhesi people in the border region, with whom India shares strong cultural ties. It is not just the politics that people are upset about. The blockade has translated into everyday hardships for everyone here, to the point that some in Kathmandu feel it eclipses even the situation they faced after the earthquake. “This crisis is more troublesome than the earthquake,” said Munni Pandey, a mother I met in Pattan, on the outskirts of the capital city. With few taxis plying, Munni was frustrated at her inability to take her children to their schools on time; at home, she was about to run out of cooking gas. Behind the negativity colouring that sentiment is the fact that the reprieve at the border is yet to alleviate the crisis in any tangible manner. Although trucks carrying fuel and other essential goods have begun to trickle in (or so I read in the newspapers), for the ordinary Nepali, nothing has really changed yet. The quota system is still in place for public transport and government-owned vehicles, which are allowed on the roads only on alternate days. Private vehicles received a slight relief when the ban on fuel sales was lifted for just one day. But in truth, the situation appears worse than it was, with the government now slashing the fuel quota for public vehicles. Many in Kathmandu are also concerned about the upcoming Dashain, the biggest festival of the year, which lasts 15 days. There is a sizeable population in the city from other parts of the country, and traditionally, most people return home for the festival. But with the fuel rationing in place, transportation will be difficult to find. For more than a week, schools have been running classes only on alternate days. Without fuel for generators, which are needed to tide over the prolonged power cuts caused by Nepal’s electricity shortage problem, businesses are seriously suffering. According to the Federation of Nepalese Chambers of Commerce and Industry, the cumulative effects of the two months of strikes, blockades and protests over the new constitution has cost the economy $1 billion. “It’s the same story for all NGOs,” said Ram Hari, who works for Mission East, a Danish NGO. His organisation faces the prospect of losing donor money because they would now not be able to finish distributing relief materials to meet a mid-October deadline. This also means that vulnerable families in Sindupalchok—the district worst-affected by the earthquake, where many are still living in tents—will not get the aid they have been promised. Importantly, the issue that has spurred the blockade and fuel crisis still remains unresolved. Talks between the government and parties representing the Madhesis—the main group protesting their under-representation in the new constitution—are taking place, and the government has agreed to some amendments. But there is still much ground to be covered. IN THE CAPITAL, though, there is much solidarity on display. People have grouped together on social media to voice their anger at India through hashtags such as #IndiaBlockadesNepal, #BackOffIndia and #DonateOilToIndianEmbassy. Residents have also resorted to sharing rides to get around. 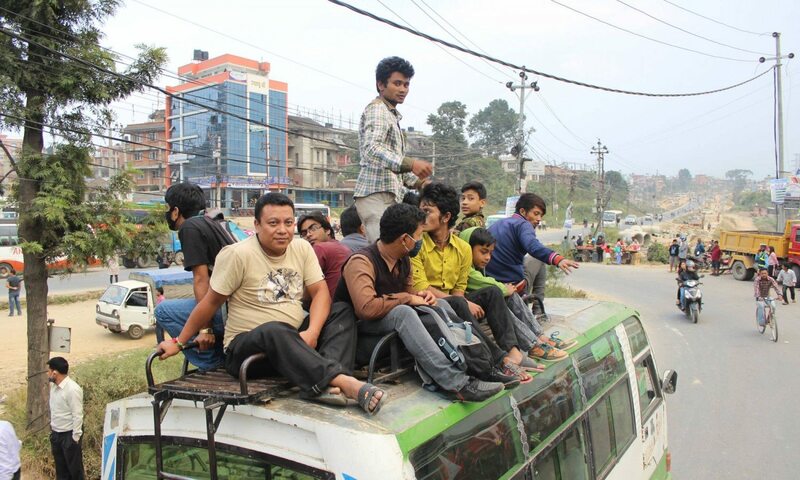 Carpool Kathmandu, a Facebook page to coordinate travel in and around the city, has now amassed more than 94,000 members. There is also a feeling that Nepal needs to rely less on India. As of now, more than 60 per cent of Nepal’s imports are from India and this over-reliance, many in Kathmandu say, makes their country vulnerable to manipulations. They point to 1989, when India imposed an official blockade that lasted 13 months, thought to be an attempt to punish Nepal for buying weapons from China. “Our situation is probably worse now than it was in the past, because we consume so many goods that are imported from India,” a Kathmandu resident said. There have been calls for Nepal to reach out to other neighbours, especially China. The road to the northern Tatopani border point, buried by landslides after the earthquake, was hurriedly cleared and reopened last week. Last week, the government-owned Nepal Oil Corporation issued a tender for the import of petroleum products from any country through any medium, hoping to break more than 40 years of Indian monopoly as the sole supplier. Besides the anti-India sentiments, many Nepalis appeared increasingly frustrated with their own politicians’ lack of action, foresight and ability to negotiate diplomatically. Following the promulgation of the constitution on September 20, Nepal’s parliament is attempting to form a new government. There is a sense that this has been prioritised over reaching a solution to the crisis. Others are angry at Madhesi politicians and protest leaders for inciting unrest, rather than negotiating. “I understand that people in the Tarai are unhappy with the constitution,” a student said. “But this is affecting everyone’s lives.” There are also many who plead the cause for unity. In Ratna Park, a group protesting India’s actions held signs referring to the three regions of Nepal: “Himal [mountain], Pahad [hill], Tarai [plains]: no one is an outsider”. Additional reportage: Namita Rao, Ritu Panchal and Unnat Sapkota.